We'll be posting updates throughout the storm as Tropical Storm Harvey impacts Texas. For the latest forecast information, check here. For the latest evacuation orders, check here. For high water locations, check here. For Houston-area shelters, check here. For critical phone numbers and links, click here. The National Weather Service has downgraded Harvey to a tropical depression. Texas Sen. Ted Cruz says he expects the Texas delegation in Congress will push for a bill to target relief for relief from Harvey. Cruz says he and several Republicans voted against funding for Superstorm Sandy because that bill had unrelated items like funding for Alaska. Cruz says funding for Harvey will not have any unrelated items. The City of Houston says its desperately in need of licensed/certified social workers at its shelters. Volunteers are being taken in at Hall A at the GRB. The city of Bellaire is joining several other cities, including Houston, in ordering a curfew from midnight to 5 a.m. until further notice. The death toll from Harvey rises to at least 18 as Harris Co. forensic office reports three more fatalities, the Associated Press reports. NRG Center at Loop 610 & Kirby opened as a shelter at 10 p.m. Shelter list. The curfew for Houston from has changed to midnight to 5 a.m. Wednesday, Mayor Sylvester Turner announced. He cited danger from high water, downed power lines and crime. There are at least two gofundme.com pages for the family of six people who drowned Monday while trying to escape floodwaters. There are reports of people posing as police officers, ICE, HSI and other officials going door to door. Do NOT open your door to anyone you don't recognize. In a press conference, Mayor Sylvester Turner warns the city is not done with flooding, even though the rains have ended. In the briefing, Turner, Police Chief Art Acevedo, Fire Chief Pena and representatives from the Coast Guard gave an update on the latest operations. The Fire Department said they conducted an additional 763 rescues on top of the 2000 already conducted, while the Fire Department said the Kingwood area remains one of the most dire areas. Turner said the George R. Brown Convention Center is now at about 10,000 flooding victims, and that number continues to grow. He said the Toyota Center will now be opened as a second shelter location, and 50 Texas National Guard members will be located there for safety. Also, due to the overwhelming response, Mayor Turner asks for donations to be dropped off at the BBVA Compass Stadium instead of the George R. Brown Center. Turner said they are in need of bedding, towels, wheelchairs, walkers and toiletries. They also need plus-size clothing. In addition to giving updates on the shelter situation, Mayor Turner said the city will also be enforcing a curfew from 10 p.m. to 5 a.m. inside the city limits until further notice. Acevedo explained that it was in an effort to counter incidents of looting and for safety reasons. Anyone found to be out at this time will face arrest, Acevedo said. Clear Creek at Country Club Drive is still in the process of cresting and should begin to drop soon. The San Jacinto River, which peaked at 69 feet has dropped to 67 feet. It's expected to drop below major flood stage by Sunday night. HEB has a 45-foot mobile kitchen to the George R. Brown Convention Center that will feed thousands of displaced by flooding. In addition, three H-E-B 18-wheelers will deliver 78 pallets of water. Buses are lining up, ready to evacuate residents away from Barker Reservoir. Kingwood Medical Center being evacuated. Six patients so far have been evacuated. United Way has raised $7.2 million so far for Houston. The situation at the Crosby site has become serious. In order to ensure the safety of our ride-out team, all personnel have been evacuated from the site at this time. We are working with the Department of Homeland Security and the State of Texas to set up a command post in a suitable location near our site. Refrigeration on some of our back-up product storage containers has been compromised due to extremely high water, which is unprecedented in the Crosby area. We are monitoring the temperature of each refrigeration container remotely. At this time, while we do not believe there is any imminent danger, the potential for a chemical reaction leading to a fire and/or explosion within the site confines is real. Mayor Sylvester Turner and HPD Chief Art Acevedo have confirmed that HPD Sgt. Steve Perez drowned during the flooding Sunday morning. Wife, father-in-law warned late Houston police officer not to go to work, @ArtAcevedo recounts. The Harris County Flood Control District gave an update on the Addicks and Barker reservoirs. A look at the evacuation efforts after the levee breach in Columbia Lakes area in Brazoria County. Houston area residents are buying up boats to go help those in need. Also, new video sent in from a viewer shows a concrete barrier washing away on the Eastex Freeway. The Harris County Sheriff's Office provided an update on their rescue efforts and on the inmates being held downtown to dispel rumors circulating. A look at people arriving at Lakewood Church to take shelter. Update from the rescues in Kingwood. KHOU 11 News' Doug Delony has a few looks from Midtown and then the KHOU 11 Studios. President Trump gave a statement alongside cabinet members and state officials in Corpus Christi. The Lake Forest Utility District is on a boil notice. President Trump has arrived in Texas. Mayor Sylvester Turner said city of Houston employees won't return to work until Thursday. He also said that the GRB capacity expanded. City now looking for other shelter locations including "mega shelters." The mayor saying more shelters are coming for Houstonians and folks in surrounding areas, cities and counties. City of Houston is asking FEMA for more help to cover food, supplies for 10,000 more people. HPD Chief Art Acevedo said there will be fullest prosecution for crime committed during flooding, will urge juries/judges for toughest sentence. He said armed robbers and looters were arrested last night. More cops from across US coming to help patrol. As of midnight, HFD has responded to more than 1,000 rescues. There are 8 area commands. Some firefighters are going on their third straight day of working. In a lot of areas, firefighters can't get in or out of their fire stations. Mayor Turner is speaking out and up against people who have been critical of the response to catastrophic flooding. USA Today reports: Tropical Storm Harvey has broken the all-time Texas rainfall record from a tropical storm or hurricane, the National Weather Service said Tuesday. Southeast of Houston, a rain gauge at Mary's Creek at Winding Road has picked up 49.32 inches of rain from Harvey, the weather service said. This broke the record of 48 inches set in Medina, Texas, from Amelia in 1978. It's only 3 inches from the all-time U.S. rainfall record from a tropical cyclone, which was 52 inches in Hawaii from Hurricane Hiki in 1950. Also, It looks like Houston Texans star J.J. Watt is raising the bar with his fundraising efforts to help the city. Lakewood is receiving people who need shelter. They said they are also coordinating with the city as a collection site for distribution. Pastor Joel Olsteen and the mega-church was scrutinized on social media for not helping during crisis. Whether the facility was safe to use came into dispute. More on that story here. Brazoria County officials say the levee at Columbia Lakes has breached and are urging residents to evacuate immediately. Families are saying that they don't feel safe at the George R. Brown convention center. ​Harvey from disturbance to Category 4 hurricane to catastrophe in 60 hours. Largest economic disaster and costliest hurricane in US history. HPD Chief Art Acevedo says officers have rescued more than 3,400 residents. Our men & women @houstonpolice have rescued over 3400 folks & counting, they will not stop until this threat ends. Stay strong Houston! Corps says Addicks and Barker reservoirs got 34 inches of rain from Harvey. That's half the total rain they usually get in a year. Harris County Flood Control says the gauges in the Addicks and Barker reservoirs have both been flooded. Trying to repair. The Cy-Fair Fire Department rescued nine victims from an overturned rescue boat who were seen hanging onto a tree. There are two more victims. Officials say they can see them and were able to rescue them too. Four out of five shelters in Montgomery County are at capacity, and people should go to College Park High School at 3701 College Park Drive. Harris County officials say that the Addicks Reservoir has crested. President Donald Trump says he is on his way to Texas to visit the areas affected by Hurricane Harvey. River Park residents are preparing for the Brazos. Montgomery County is still expected to receive an additional rainfall amount between 10 and 15 inches throughout the rest of the week. In the last 24 hours, the county has seen between 4 and 6 inches of rain. The grounds are saturated, rivers and creeks continue to swell. Areas that flooded in 1994 will be inundated with water again. If you are in a low lying area prone to flooding, you need to get to higher ground now. We have several Red Cross Shelters open and receiving evacuees. If you receive a message on your mobile device to evacuate, do so immediately. The George R. Brown Convention Center is still accepting people who are seeking shelter. They no longer need clothing unless it's plus sized, and are asking people to stop bringing in large amounts of clothing. Blankets and towels are still needed. Volunteers mus first sign up on the Red Cross's website. Latest reading of Addicks Reservoir shows water up to 107.62 feet. It is now just 4.56 inches from reaching top of north spillway. Rosenberg police release an updated list of road conditions. The current elevation of Addicks Reservoir is 107.11ft. The engagement of N spillway is at 108.0ft. The reservoir is expected to crest later this morning. Fort Bend Office of Emergency warn residents of individuals posing as city or county employees, knocking on doors and telling residents that they are now under mandatory evacuation orders. Officials say this is happening in areas where there are no mandatory evacuations. Residents are being told to not trust strangers are their door without proper credentials. The number of people seeking shelter continues to grow. Nearly 9,000 people have now taken shelter from flooding at Downtown Houston's George R. Brown Convention Center since it opened as a shelter on Saturday. A man between the ages of 60 and 70 is presumed to be dead after trying to swim across the flood waters at Spring Park Ridge and SH99. This brings the death total to nine. Dozens of neighborhoods in Fort Bend County to be affected by an estimated 59 feet of flooding. 3-day hold requests have been lifted at the Harris County Animal Shelter to help reunite lost pets with owners. SH 99 is closed in both directions at the Brazos River, Fort Bend Sheriff's County Office reports. The Harris County Sheriff's Office says they are no longer looking for volunteers with boats or high water vehicles. They are encouraging people who want to volunteer to reach out to charitable groups like the Red Cross or Volunteer Houston. More than 7,000 people have taken shelter from flooding at Downtown Houston's George R. Brown Convention Center since it opened as a shelter on Saturday. The Houston Office of Emergency Management says many people are tying up the 911 lines, asking for information on evacuation orders in the city. OEM wants to make it clear that there are no mandatory or voluntary evacuation orders in the City of Houston proper and people should not call 911. 911 should only be used for life threatening emergencies. There is a mandatory evacuation in place for the Northwood Pines Subdivision. St. Luke's hospital begins evacuations. Southwest Airlines says flights to and from Houston's Hobby Airport have been suspended until at least noon Thursday. Rosenberg Police have issued more evacuations. Houston sports team owners are pledging help to flooding victims. KHOU 11's meteorologist David Paul's updated weather forecast indicates the rain threat could start to let up by Tuesday evening. "Tomorrow evening, the heaviest rain threat is moving northeast, and that will continue to accelerate," he said. "The entire rain threat may be gone by Wednesday morning." A mandatory evacuation has been ordered for the Inverness Forest and Northgate subdivisions. Click here for the latest evacuations. Neighbors Telehealth is offering free online medial care for Harvey victims. In a press conference, the U.S. Coast Guard says that they've rescued 3000 people on Monday alone. They're getting about 1000 calls every hour. The Fort Bend Sheriff's Office says multiple shelters have reached capacity. Shelters at Capacity: BF Terry HS, Gallery Furniture, Sugar Creek Baptist Church and Cinco Ranch High School. See a full list of shelters. A shelter-in-place has been ordered for LaPorte after a chemical leak was reported. The chemical has been identified as Anhydrous Hydrogen Chloride, which could cause eye, throat and nasal irritation. LaPorte officials say the Fire Department is actively working on a leak from a pipeline in the Hwy 225/Hwy 146 area. Residents living in the northeast part of the city are asked to shelter in place. The order is for the area bordered by Farrington Road on the west, N. Avenue H on the South and Hwy 146 on the East. Sourhtbound Hartman Bridge is closed until an all-clear has been given. More information on shelter in place instructions are available at www.LaPorteTx.gov/shelterinplace. Per City of Shoreacres: Chemical release notice. Shelter in place. Stay inside. Close windows/doors. Turn off air conditioning/ventilation. At least eight people have died in the Houston area so far from winds and flooding. Volunteers from Baton Rouge are meeting at The Church at Creek's End to help rescue victims. Anyone with a boat and life jackets can join them at 20010 Kuykendahl road. About 200 people and some pets are seen evacuating from Dickinson. The Associated Press reported Monday afternoon that the Astros and Rangers would play their three-game set at Tropicana Field in St. Petersburg, Fla., where the Tampa Bay Rays play their home games. Leslie Alexander and Houston Rockets contributing $4 million to Mayor Turner's Hurricane Harvey Relief Fund. St. Luke's Hospital at Highway 249 & Cypresswood has been evacuated. Water can be seen almost at roof level in a Spring neighborhood. A hotline was just set up to help low income victims of Hurricane Harvey with legal questions. The State Bar of Texas's hotline, (800) 504-7030, can help people with basic legal questions, or to find legal resources in their area. Marshall High School in Missouri City will open as a shelter to those in need at 4 p.m. The school is located at 1220 Buffalo Run, Missouri City, TX 77489. Shelter and food will be available to those displaced by Tropical Storm Harvey. Fort Bend ISD, in coordination with the American Red Cross, will be staffing the shelter with volunteers and providing necessary items, but for comfort and convenience, families who are seeking shelter may want to consider bringing bedding, snacks, children’s games, chargers, water, paper plates and disposable silverware, towels and flashlights. The B. F. Terry High School Shelter is full. It is important to check the capacity status of shelters before arriving. The City of Dickinson issued a mandatory evacuation. The Fort Bend County Office of Emergency Management released a list of mandatory and voluntary evacuations orders for neighborhoods near the Brazos River. Family members say six people have drowned in floodwaters in northeast Houston on Monday. Four siblings under the age of 16 and two elderly people drowned. The elderly people were the great grandparents of the children, according to family members. Relatives say all six are presumed dead at this time. Their bodies have not yet been recovered. We are working to gather more information on what happened. Check KHOU.com and KHOU 11 News on Facebook and Twitter for updates. Manuel Saldivar, 84, and his wife Belia, 81, along with their six young great grandchildren drowned in floodwaters during Tropical Storm Harvey on Sunday, August 27, 2017. Pearland will continue its curfew from 10 p.m. to 6 a.m. tonight. The City of Pearland will continue its 10 p.m. to 6 a.m. curfew tonight, Aug. 28. A mandatory evacuation is underway in Sienna Plantation. State troopers say residents can take Highway 6 and LJ Parkway. Certain Houston-area HEB's are open in case you need groceries. Mr. McNair and the Houston Texans are pledging $1 million to flood relief fund. City officials provided updates on rescue operations in the Houston area as a result of Tropical Storm Harvey during a press conference on Monday morning. Houston Police Chief Art Acevedo says the city has 185 critical rescue requests still pending. They have completed 2,000 rescues. Former President and Mrs. George H.W. Bush release a statement, saying "This we know: Houston, and Texas will come together and rebuild." The Cy-Fair Volunteer Fire Department strongly recommends the following neighborhoods voluntarily evacuate by 7 p.m.: Twin Lakes, Lakes of Eldridge, Stable Gate and Jersey Acres. A mandatory evacuation has been issued for Sienna Plantation. This is an upgrade to the voluntary evacuation that was originally issued. Cynthia Jamieson with the Office of Emergency Management in Montgomery County describes the current situation in Montgomery County. Operations remain stopped at IAH. Operations are still stopped until further notice. We are doing everything we can to resume operations once it's safe to do so. The water at Highway 288 & Old Spanish Trail is roughly 6 feet high. Army Corps of Engineers held a press conference to discuss the controlled release of the Addicks and Barkers reservoirs. Officials say Bear Creek was the first subdivision to be impacted around 4 a.m.
Officials said the water levels in the reservoirs have increased dramatically. As of Monday at 7 a.m., the reservoirs have risen 25 inches for Addicks and Barker, officials said another 25 inches could occur. Down stream flooding being seen in Lake Jackson. They have had almost 8 inches of rain in total since Harvey began affecting the Houston area. Officials with FEMA hold a press conference regarding regarding recovery and rescue operations for Tropical Storm Harvey. Brock Long, FEMA administrator, says we’re not at recovery level yet because swift water rescue, search and rescue efforts are still ongoing. He urged the public to get involved. “We need the whole community, not only the federal government," said Long. FEMA expects over 30,000 people to be placed in shelters. Their next objective is to stabilize survivors after search and rescue. For those able to help, click here. For those in need of disaster assistance, click here. Although the Brays Bayou is lower than it was at Macgregor Way & Ardmore, the water is still very high with a lot of floodng around it. Tropical Storm Harvey changes track. A brand new track from the National Hurricane Center shows a shift that could make all the difference for the Houston area. Monday, the governor of Texas, Greg Abbott is adding 1,000 more members of the National Guard to Houston. Rescue boat operations have been suspended for the night due to safety issues. The Lake Conroe water level has now risen to 205.88 feet above mean sea level (MSL). The previous record water level for the lake was 205.60 in 1994. The U.S. Post Office has announced that most service in the Houston area, including mail delivery, has been suspended. The center of Tropical Depression Harvey is hovering in the Matagorda Bay area, continuing to crank moisture into SE Texas. Parts of Harris County have received over two feet of rain in the past 48 hours and forecasts for the next few days are for rainfall that could hit 15 to 30 inches by Thursday. Harvey is expected to re-form into a minimal tropical storm over the Gulf of Mexico before making another landfall near Galveston Wednesday, then quickly moving through Houston and heading north out of the area into Thursday. Houston Airport System remains closed until further notice.The system was able to help more than 700 stranded passengers throughout the day. More than a dozen, mostly locals remain stranded at Hobby Airport. Officials with flood control management have requested a voluntary evacuation for parts of Inverness Forest Subdivision north of Kingsbridge Road. Water there is expected to go over levee. Residents are asked to leave by midnight. Galveston ISD is announcing the decision to cancel classes for students Monday, Aug. 28, 2017 through Friday, Sept. 1, 2017. KHOU has confirmed that floodwaters have reached the two lowest levels of the Wortham Center. Breaking: #khou11 has confirmed there is floodwater in the 2 lowest levels of the Wortham Center. Mandatory evacuations are under way for residences on Huntington Road. Harris County water management official Jeff Lindner say they plan to perform controlled releases of the Addicks and Barker Reservoirs. The Addicks Reservoirs will be opened at 2 a.m. while the Barker Reservoir could be opened 24 hours later. People living along those areas need to prepare for increased flooding. Officials say both reservoirs are in a "rapid state of rise," and the Corps of Engineers say they need to release some of the water. See more on this story here: Controlled release of Barker & Addicks Reservoirs to impact thousands. Two deputies, one from Louisiana and another from the Texas Parks and Wildlife Department, had to be transported after being injured in an accident involving a rescue boat in Dickenson. Texas City Fire Department members loaded them into an ambulance. Galveston County Sheriff's Office and Galveston Police Department say they're ending rescue operations for the night because it's too dark to conduct rescues safely. County offices will be closed Monday. Galveston deputies confirm two flooding fatalities in Dickinson. Houston Community College will remain closed from Monday, Aug. 28 through Monday, Sept. 4. All classes and campus activities will be cancelled during this time. However, students may continue to register online while HCC is closed. The campus will reopen Tues. Sept. 5. Bayshore Medical Center in Pasadena is forced to evacuate due to rising water. There are 196 patients being sent to other hospitals. A good Samaritan uses vehicle to rescue flood victims. Video shows rising flood waters in Huntsville. The railing seems to have broken at the Boheme Road overpass over Beltway 8. JJ Watt says, "We must come together to help rebuild our communities." Photos show catastrophic flooding across the Houston area. President Donald Trump will travel to Texas on Tuesday.White House press secretary Sarah Huckabee Sanders tells reporters the White House is still coordinating logistics with state and local officials. She said,"We continue to keep all of those affected in our thoughts and prayers. "Tropical Storm Harvey sent devastating floods pouring into Houston on Sunday. Rising water chased some people to rooftops or higher ground and overwhelmed rescuers." Trump has been praising the government's response to the storm on Twitter. He tweeted earlier Sunday that he would be traveling to Texas as soon as he could go "without causing disruption." He said, "The focus must be life and safety." More than 300 people were rescued by the Chambers County Sheriff’s Office, Cove Volunteer Fire Department and Trinity Bay EMS. The City of Friendswood has a curfew in effect from 10 p.m. to 6 a.m. Also, the city says its drinking water is safe. Beginning Sunday, August 27 in the City of Friendswood a curfew is in effect from 10 p.m. to 6 a.m. The City of Friendswood has received reassurance that the City’s drinking water is safe, plentiful. All purification plants are operational. KHOU 11 Reporter Grace White provides an update from the Galleria area. Harris County deputies are performing rescues in the Blackhorse subdivision. Massive flood damage seen in Dickinson. Video shows Buffalo Bayou out of its banks. Street signs are barely visible outside the University of Houston. Rosenberg officials say they are not turning off the water. HPD says there has been more than 1,200 rescues. The @houstonpolice has rescued over 1,200 folks with more to come. Grateful for assistance of Task Force 1 & other partners. Authorities need your help with rescues. Do you have a high water vehicle or boat? Officials say all 22 watersheds are over their banks. Harris Co. Flood Control: All 22 watersheds are over their banks. Some places are experiencing flooding higher than Allison. City opening George R. Brown & multiservice centers as shelters. Mayor Sylvester Turner says the water is safe and it will NOT be turning off. County Judge Ed Emmett says Ben Taub hospital is being evacuated. Fort Bend tolls are suspended as of this morning until midnight Sunday night. Also, parking is available at Cinco Ranch High School for vehicles threatened by flooding. Fort Bend tolls are suspended as of this morning until midnight Sunday night (August 27). Katy ISD will be closed next week. Rosenberg officials report a massive sinkhole is in the 3900 block of FM 762, in front of 24 HR fitness. Avoid this area! The Coast Guard helicopter is conducting rescues across the Houston area. As of 10:43 a.m., they tweeted they had six helicopters and nine Flood Punt Teams conducting rescues. All MD Anderson Cancer Center locations will remain closed for outpatient services and appointments, as well as surgeries, on Sunday, Aug. 27, and Monday, Aug. 28, due to severe weather in the Houston area. Currently, roads around the Texas Medical Center Campus are impassable. Patients and staff should not attempt to travel. Brazoria County officials have issued a mandatory evacuation for those living south of Highway 6 and west of Highway 288. The KHOU 11 signal cut out just as the Harris County Sheriff's Office crews got their rescue boat in the water to pull a semi driver out of his flooded cab. See the rest of the video. The floodwater from Buffalo Bayou is coming up Taft street from Allen Parkway. Mayor Sylvester Turner says, "This storm will not break our spirit." I-10 Katy Fwy EB blocked at 610. High water at Washington. Rescue are underway in the Sagemont neighborhood. KHOU 11 is being forced to evacuate its building due to the high water. Flooding in Dickinson, Texas appears to be getting worse. Officials in Harris County have rescued more than 100 people at this time. Pearland has a curfew curfew starting Sunday night from 10 p.m. to 6 a.m.
Tonight, the City of Pearland will enforce a curfew from 10 p.m. to 6 a.m.
Allen Parkway near downtown Houston is completely flooded. Beltway 8 near Imperial Valley has flooded with water spilling over into the highway from the frontage road. Some areas of Harris County have received more than a foot of rain in the past 6 hours. A look at how high the water has risen at Buffalo Bayou. KHOU 11 News is moving to the second floor to continue news coverage on TV and via our live stream. A view of flooding waters on Beamer Rd near Beltway 8. Water has started to come into the KHOU 11 News Station. Trucks are seen stranded in flooding water off of Beltway 8 near Pasadena, Texas. The Bastrop Fire Department tweeted: City of Bastrop has opened a shelter due to HWY 71 road closure. Shelter at First United Methodist Church of Bastrop 1201 Main St.
City of Bastrop has opened a shelter due to HWY 71 road closure. Shelter at First United Methodist Church of Bastrop 1201 Main St. The City of Houston tweeted: 911 services at capacity. If you can shelter in place do so, a few inches in your home is not imminent danger. Only call if in imminent danger. The Houston Police Department tweeted: Avoid IH-45 inside the loop both directions; if on the freeway and stopped by high water, do NOT go against traffic; shelter in place. Avoid IH45 inside the loop both directions; if on the freeway and stopped by high water, do NOT go against traffic; shelter in place. Desperate flood victims all over the Houston area are taking to Twitter to plead for help. Many are tweeting Harris County Sheriff Ed Gonzalez. He has been responding to Houstonians in need and connecting them to other agencies that can assist. Hobby Airport tweeted: Airfield is closed due to standing water on runways. No inbound/outbound flights. Please check flight status before coming to HOU. Emergency officials in Houston are urging the public not to call 911 unless their life is in danger. They are overwhelmed with calls and need to keep the lines open for life-threatening emergencies. Harris County Sheriff Ed Gonzalez tweeted: Parts of Gulf Freeway have over 60 stalled vehicles. Parts of Gulf Freeway have over 60 stalled vehicles. Jersey Village Police Department tweeted: Advising evacuation from all homes in Jersey Village along the Bayous and low areas. Please call dispatch at 713-466-5824 if help needed. Advising evacuation from all homes in Jersey Village along the Bayous and low areas. Please call dispatch at 713-466-5824 if help needed. A "shelter-in-place" order is in effect for the city of Pasadena. The city has roadways are flooded and impassable. A shelter in place has been issued for Pasadena. Flooding is ongoing; roadways are impassable. Please do not leave until all-clear is given. Houston Police Chief Art Acavdeo says the department is assisting in the evacuation of two apartment complexes in the Greenspoint area. The Houston Texans' Public Relations team sent out a statement on the team's delayed return to Houston due to Tropical Storm Harvey. One person has drowned in a vehicle in floodwaters on Warrenton and Gessner. The person was pronounced deceased on the scene by officials. The Fort Bend County Sheriff's Office tweeted: High water - Sunrise Meadow Subdivision is beginning to have high water throughout the entire subdivision. Please use caution. High water - Sunrise Meadow Subdivision is beginning to have high water throughout the entire subdivision. Please use caution. KHOU 11 anchor and reporter, Jason Bristol, tweeted photos from his neighborhood where a tornado touched down on Saturday. KHOU 11 viewer Sandra Judge sent in video of a tornado touching down in the Towne Lake area in Cypress, Texas Saturday afternoon. We have received multiple reports of tornadoes touching down in northwest Harris County. No reports of injuries so far. The U.S. Coast Guard holds a press conference on Tropical Storm Harvey. Mandatory evacuation in effect in Rosenberg. The Brazos River is expected to crest around 55 feet or higher. Harvey has now been downgraded to a tropical storm. Port Galveston remains closed. Find the latest update by clicking here. Texas is evacuating three prison units along the rising Brazos River. IAH - 133 Cancellations, 75 Delays; IAH is currently under a ground stop due to heavy storms. 23 aircraft have been diverted to DFW Airport. Houston Bush Airport also issued a ground-stop. City of Lake Jackson crews are out clearing the streets and checking drainage. Officials say they're also prepared to begin pumping operations if flooding occurs. City Hall employees are answering storm-related questions at 979-415-2400. Power outages from the Houston area to the coast are wide-spread. Shortly before 7 a.m., CenterPoint Energy was reporting about 70,000 customers in the greater Houston area, mainly south of I-10, were without power. Meanwhile in Matagora County and stretching to Corpus Christi, there were about 193,000 customers without power. Check the latest outages here. Hurricane Harvey continues to move inland and has been downgraded to a Category 1 storm with maximum sustained winds at 90 mph. The National Hurricane Center forecasts that Harvey will lose steam and likely become a tropical storm later, Saturday. The center of the storm is now located about 30 miles southwest of Victoria. Click here for the latest. KHOU's Noel Brennan is reporting that Corpus Christi issued a boil water notification overnight. Hurricane Harvey has weakened slightly and has been downgraded to a Category 2 storm. Maximum sustained winds are about 100 mph, with the center of the storm located about 30 miles southwest of Victoria, Texas. At least three homes have been destroyed after a massive fire broke out on Bolivar Peninsula late Friday night, according to 12 News Now. Corpus Christi police say a homeowner in the city shot an intruder trying to break into a home during the hurricane. Click here for the story. Hurricane Harvey is now a Category three storm, packing sustained winds of 125 miles per hour. The center of the storm is located about five miles north of Rockport. The storm made a second landfall Northeastern Shore Of Copano Bay early Saturday morning. From TDCJ: Units potentially affected by Hurricane Harvey have stocked up on additional food, water, medications and other necessary items. If power is interrupted, bulk fuel and generators can be utilized. The department has also staged additional resources and staff in areas that maybe impacted. Given the storm's current projections, offenders at secure facilities will shelter in place. The department is continuing to monitor the storm and is prepared to make necessary adjustments as needed. Wildlife are also in danger from this massive hurricane. 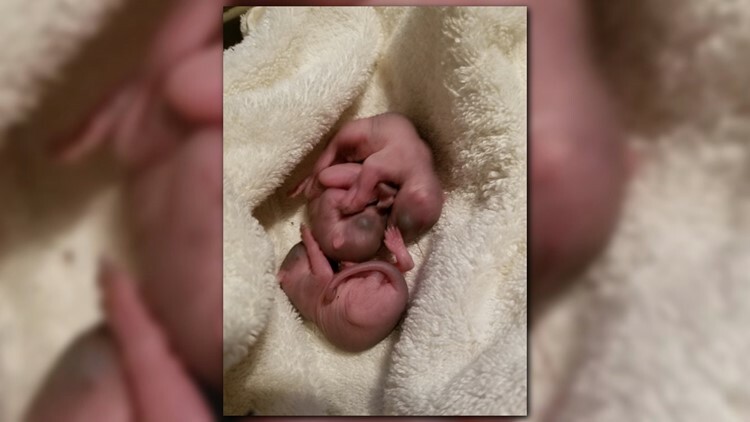 Karen Borovsky found these baby squirrels displaced as the hurricane approaches. If you find injured or displaced wildlife, call the Texas Wildlife Center. Police Chief Art Acevedo: "Please do not place yourself, loved ones or courageous first responders at risk by ignoring warnings and taking unnecessary risks." Texas Children’s Hospital is closing all clinics and canceling all outpatient procedures at the three campuses on Saturday, Sunday and Monday, including the Texas Medical Center campus, West Campus and The Woodlands. Texas Children’s Health Centers and Specialty Care locations, as well as community Maternal-Fetal Medicine and OB/GYN clinics will also be closed Saturday, Sunday and Monday. The Centers for Children and Women will be closed Saturday and Sunday. The decision regarding closures beyond this timeframe will be determined over the weekend. A limited number of Texas Children’s Pediatrics practices are open half day on Saturday. Please check the Texas Children’s Pediatrics Facebook page for specific information. All Texas Children’s Urgent Care locations will continue normal operations until notified otherwise. Mayor Turner: "Remember to check on your elderly and disabled neighbors throughout this rain event. Remain calm but stay alert." "It never hurts to pray for those that are in the hurricane's way and for this city," Mayor Turner said. "You know, we can't control mother nature, but prayer has a way of moving things. So let's just stay calm, let's stick together as a family." County Judge Ed Emmett: We are not calling for mass evacuations in the Greater Houston Area. When we say "run from the water, hide from the wind, we're talking about storm surge, not rainfall." KHOU 11 News Meteorologist Brooks Garner: Hurricane Harvey could bring wind gusting over 150 mph in the Corpus area. The Greater Houston Area will not see a big impact from Harvey's wind. Alert Houston update: The City of Houston is preparing for significant impacts from Hurricane Harvey, currently a Category 3 and expected to make initial landfall between Matagorda Bay and Corpus Christi. The storm's current track suggests it will drift back along the coast and make landfall again near Galveston around Tuesday. Impacts to the City of Houston are expected to mostly be significant rainfall. The National Weather Service forecast currently indicates that Houston will see close to 20 inches of rainfall over the weekend and into early next week. This is likely to cause dangerous flooding throughout the entire Houston region. Our crew in Galveston reports wind damage along the Seawall near 6th Street on the East End. A McDonald's sign was blown down by a possible tornado. Galveston County Judge Mark Henry is urging residents of Bolivar, Crystal Beach, Gilchrist and High Island to heed voluntary evacuation orders and leave the peninsula before ferry service is suspended. Due to high winds, TxDOT is anticipating suspending ferry service later Friday until further notice. Hurricane Harvey has just been upgraded to a Category 3 storm with winds of 120 mph and pressure of 943 mb.